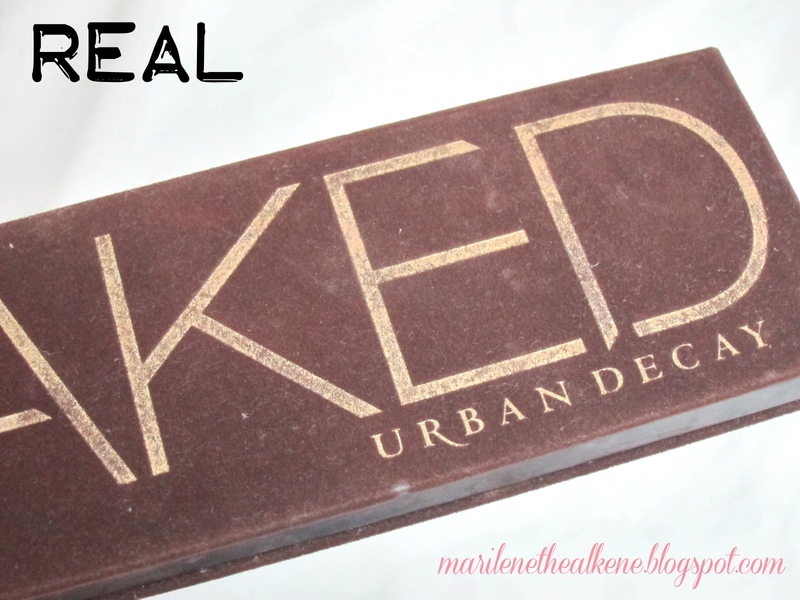 If you have been living under a rock, the first NAKED palette was released by Urban Decay in mid-2010. The time it was first released, the blogosphere and makeup world exploded. 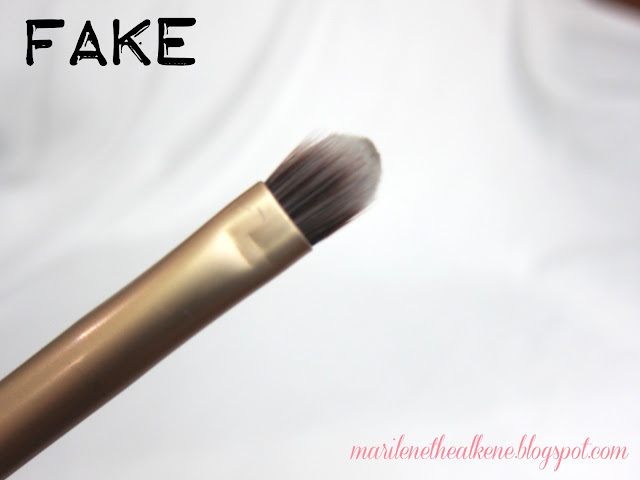 Every one who loved makeup wanted this product, and for good reason. 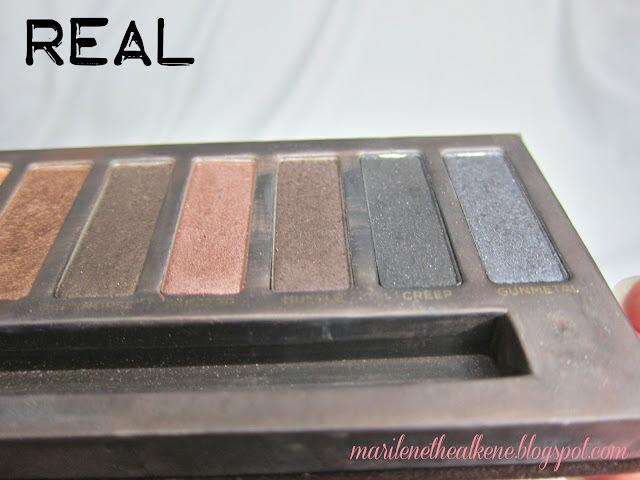 It was an Urban Decay product (so we're sure of the good quality) and it's a palette with the most useful and versatile shades a girl could ask for. Moreover, if my observations are correct, it is the first palette to contain just neutral colors and not combine crazy colors (like lime color and lemon yellow color) with neutral colors. I used to see all sorts of girls' half used palettes and you would see the crazy colors untouched and the brown color already showing the metal pan it lies in. This is why it immediately went out of stock and it took a while before it came back in stock. It also took a while before the product could be easily purchased because for a long time, it was either out of stock or if there were even stocks, you would have to compete with hoarders and all. Given that this is the strongest offering that Urban Decay has, and that this is a highly coveted product in the makeup world, it is a sad truth that there are many people who are making fake ones and selling them for the price of the real ones. To begin my story, I went with my mom to visit a family friend, and upon seeing me, this family friend hands me a box. When I opened it, it was a NAKED 2 palette. I was extremely happy as I had a new eyeshadow set, and for about 2 hours I thought it was authentic until I gave close scrutiny of the product. 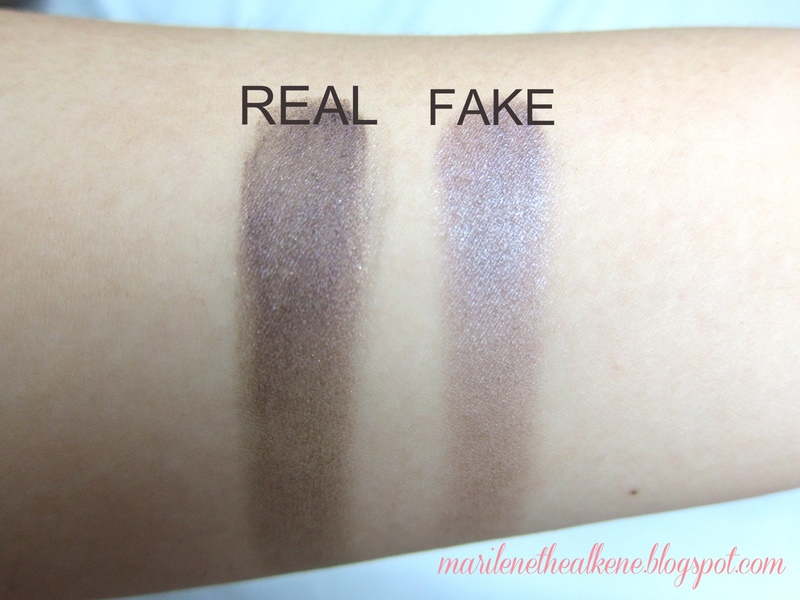 I also owned a real NAKED 1 (I know it's real because I ordered it from Sephora) so I was able to notice what general differences the fake one had with the real one. To clarify, even when I realized that it was not authentic, I was still very happy because I did nothing and yet got a 12-color eyeshadow set that's usable. I no longer called up the giver to tell her that it was not authentic because I did not want to seem ungrateful and I didn't want to embarrass her. I also had a feeling that maybe she bought them with the consciousness that they were not real, and probably bought them at a lower price. I am not comparing my real NAKED 1 and the fake NAKED 2 part by part as the two are inherently different products, but these are some general guidelines that you can apply regardless of whichever NAKED palette that you plan to buy. Please read on for more information. 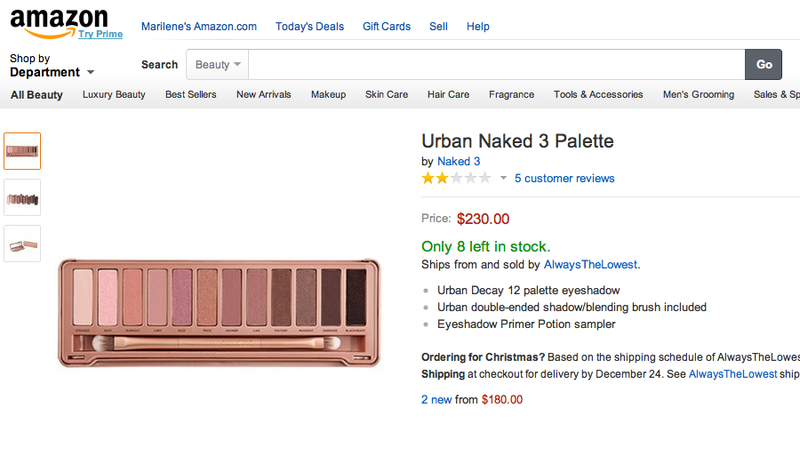 The real NAKED Palettes come with a 'present.' 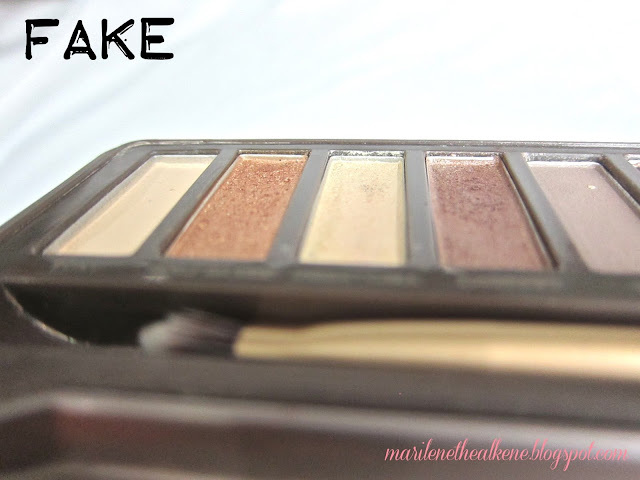 NAKED 1 comes with a sample sized Eyeshadow Primer Potion in the original shade, NAKED 2 comes with a baby Lip Junkie Lip Gloss in the Naked shade, and NAKED 3 comes with a small folder containing samples of all their eyeshadow primers. 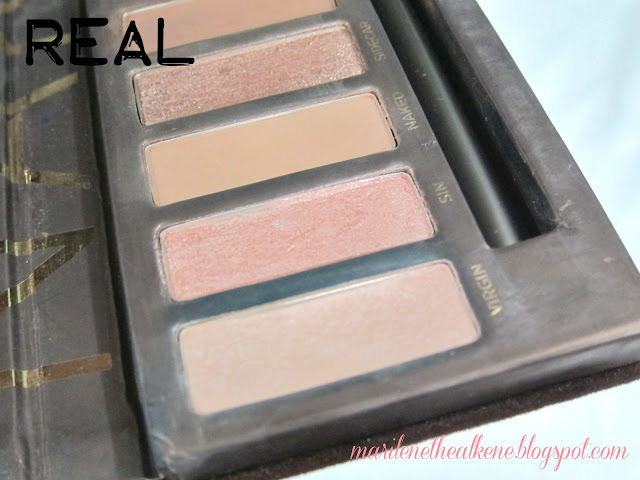 The NAKED 1 and 2 palettes are placed on this plastic base, with the present in sight, inside an acetate box. Only NAKED 3 comes in a cardboard box. 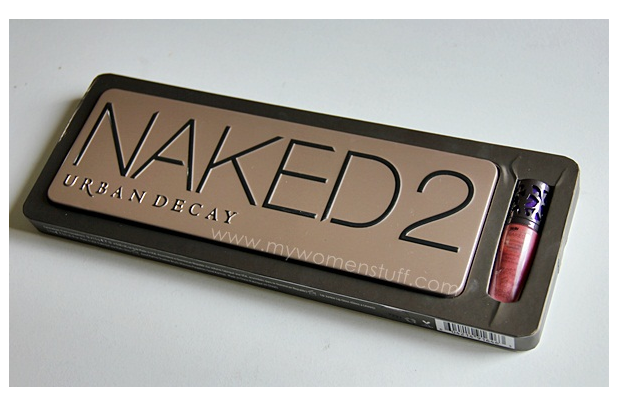 If you see the blog post on this on mywomenstuff.com, this is how the NAKED 2 palette's packaging should be. It should come with a lip gloss and be contained in a holder. 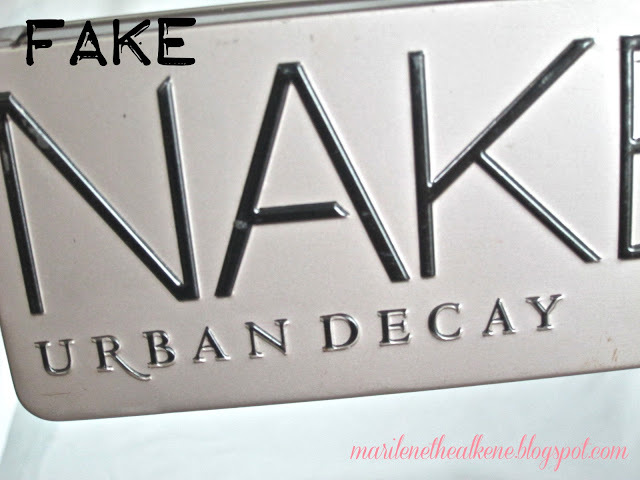 EDIT: As of first quarter 2014, Urban Decay repackaged the Naked 2 palette. 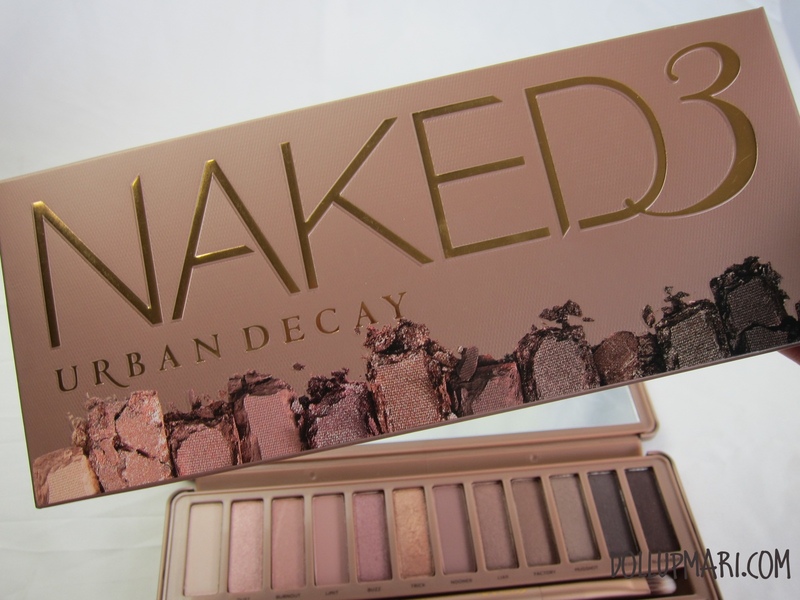 The box now looks like the Naked 3's box, only with a different number and different eyeshadows represented. There is no longer lip gloss in it, but instead an eyeshadow primer sample pack like in the Naked 3 palette. This fake one came in a weird cardboard box and there was no lip gloss that came with it. The outer text of all the palettes should be aligned to the embossed or the textured area of the palette. You can see the perfect alignment of the gold print on the embossed area of my real palette, and the misaligned Urban Decay print on my fake palette. 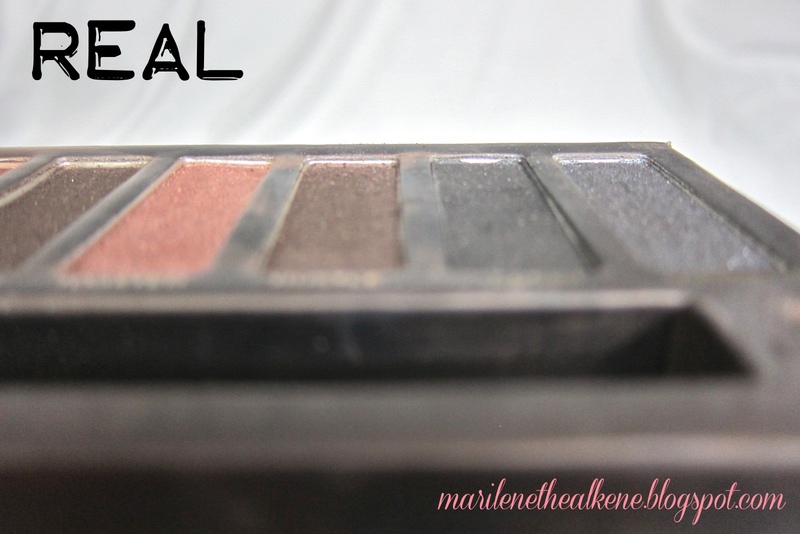 The real palettes come with super buttery, super pigmented eyeshadows. The reason why everybody's going ga ga over this is one, the colors, and second, UD's long-known super blendable eyeshadow quality. 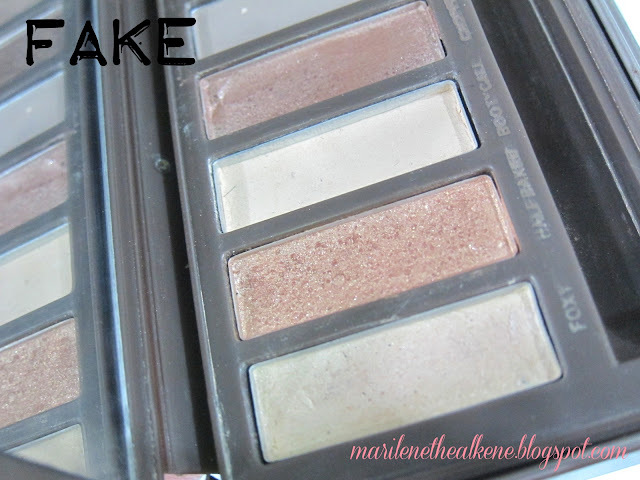 The eyeshadows should be jam-packed in color and should be blendable as well. To compare, I swiped the eyeshadow with my finger and applied it on my arm, and repeated the swipe process three times for both the real and fake one. You can see that on the left, even towards the bottom of the photo, you can still see that the real one still packs a lot of color. The fake one, on the other hand, is already faded towards the bottom of the photo. In general, if you observe the NAKED 1,2,3 together, you would notice that in 2 and 3, some pots are seated deeper than others.. 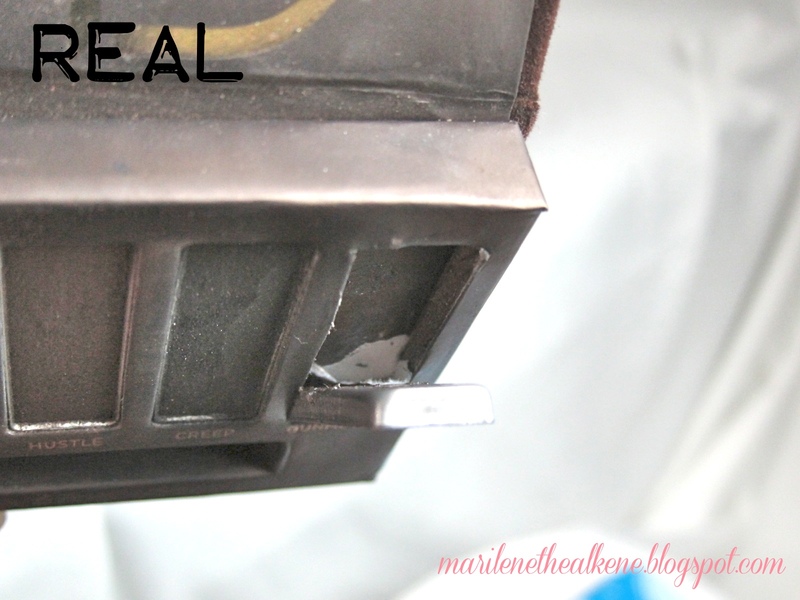 BUT as with any other eyeshadow brand, the pots should more or less be equally filled. All of them should more or less be filled to the brim, as what you see right now in my real palette. If you look at the pots, you can see that each eyeshadow reveals the same amount of surface area of the pot, meaning that the palette is evenly filled. Then look at my fake one. You can see that the leftmost color is just half-filled, the second two thirds filled, while the third color from the left is almost filled to the brim. 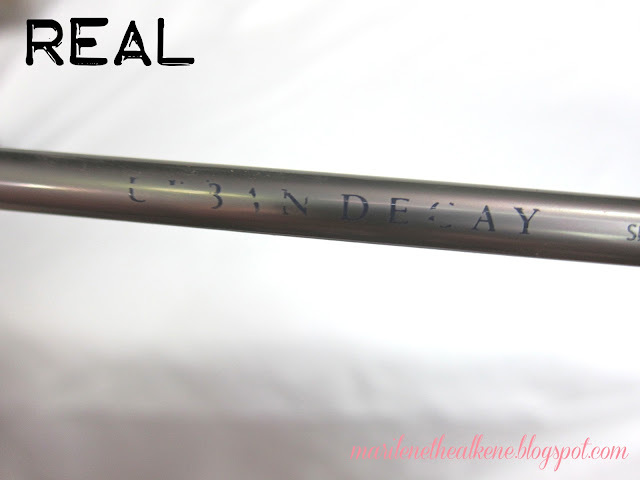 UD will most certainly not allow a product of this quality to be sold to the public. 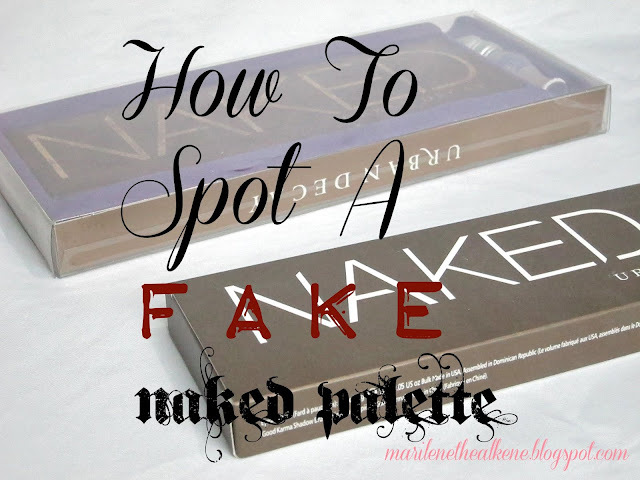 In general, too, the way that the pans are placed on the palette can help spot a fake. 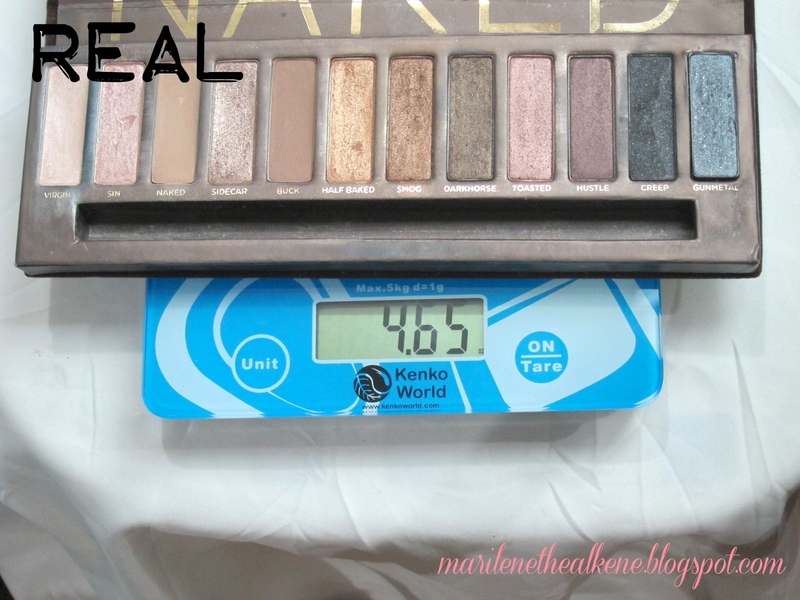 Real palettes have the pans placed in such a way that they all look evenly placed. But on the fake one, you can see that aside from the pans themselves being unevenly filled, some pans also sit lower than the others, unlike the real one. Like the plastic shell is uneven, or maybe some pans were glued with lots of glue while others had significantly less glue that the result is something like this. 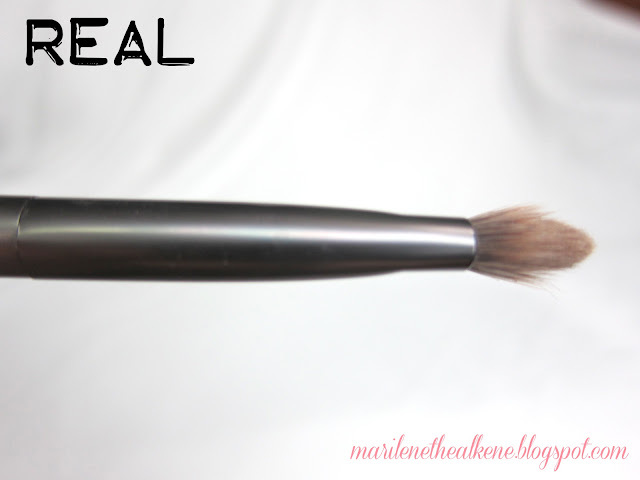 You can see that my real brush's metal holder part has one smooth line (as in the line where the hairs are 'squeezed' into the flat shape of the brush), and that sideways it looks rounded. 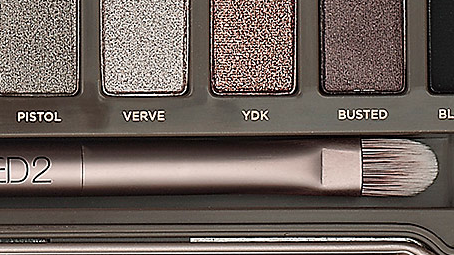 If you go to Sephora.com and look at the zoomed in photo of the brush of the NAKED 2 palette, it's supposed to come with one cleanly done line to crimp the hairs in place. Moreover, the color is bronzy and the brush hairs are a bit long. Meanwhile, you can see that the fake one comes with two strong, uneven lines to hold the hairs in. And that sideways, there is a dent in it. It's also not bronzy in color, and the brush hairs are not as long as they should be. Though this is not something that you will immediately see, the real palette's brushes come with more element-resitant text. I had just been using the fake brush for about half a year and yet the text is more erased than the real brush that I had been using for almost two and a half years. I don't really have a better for pressed-ness so I will just explain further. So basically the real ones come with eyeshadow powders that are pressed really well that they do not easily flake off or get carved off in case my nail accidentally scratches the eyeshadow. The following photos show what happened after I had accidentally scratched the palette, and the other scratches that have been in it. 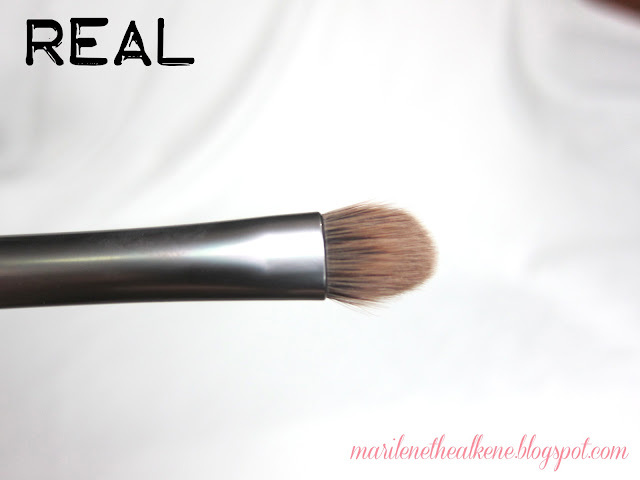 It is less pigmented than the real one and yet much softer in structure that it easily gets displaced and gives off a lot of fallout when applied. 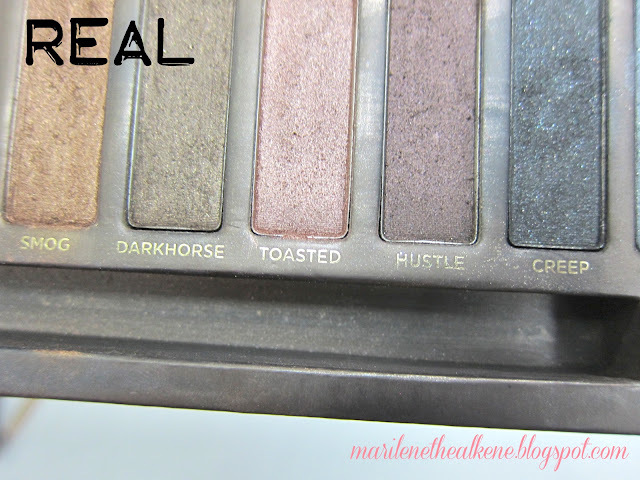 This is also not an easily seen sign, but real palettes have the eyeshadow names printed well on the palette that they are able to withstand daily use. Moreover, they are able to withstand it when wiped with rubbing alcohol. 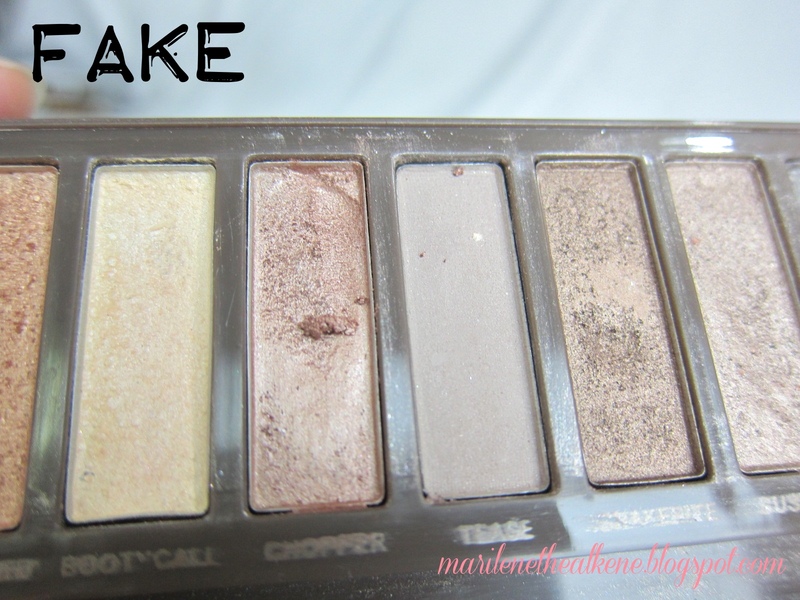 My fake palette's letters fell off on their own even if I had purposely avoided the letters when cleaning with alcohol, which is a big difference to my real palette's lettering that is still strong as ever even after I had cleaned the palette with rubbing alcohol and baby wipes a gazillion times since I got it. The more obvious sign, though, is that the fonts and colors used in fake ones' texts are usually tackier-looking than the real palette's... 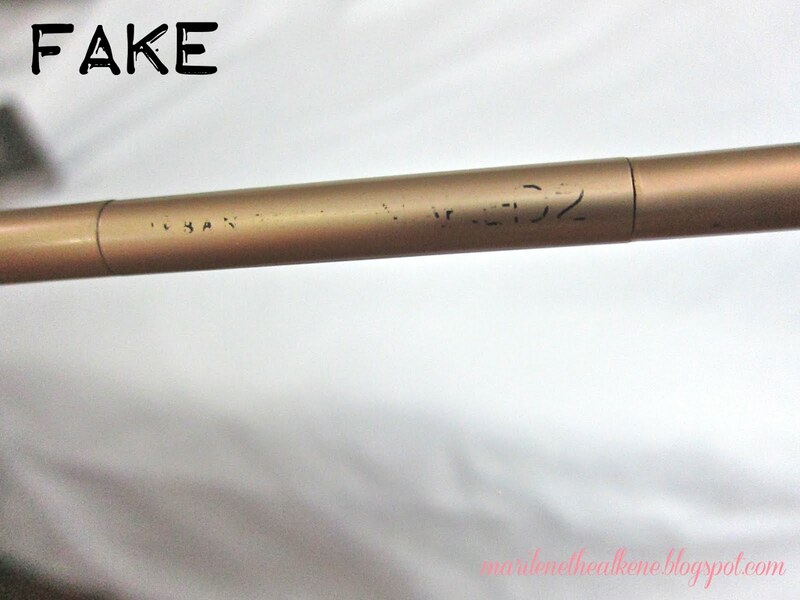 If you feel weird about the font or writing of the text, chances are it is fake. This is not a visual sign, but if you suspect that you have purchased a fake one, you can try this process. UD's website says that each eyeshadow is 0.05 ounces. 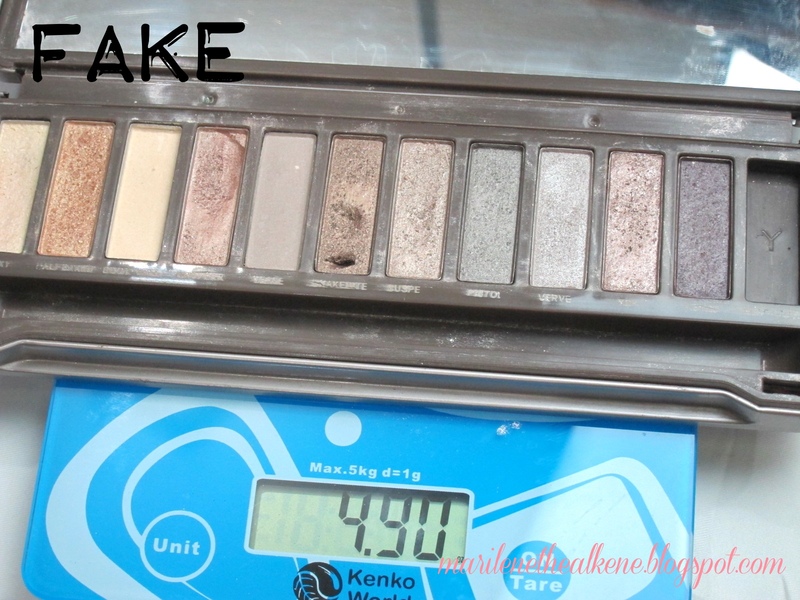 I recorded the mass of the whole real palette (4.65 oz) and took out one of the eyeshadows (the one that I had used the least so that its mass would be the closest to an unused unit's mass), and weighed the whole thing again. 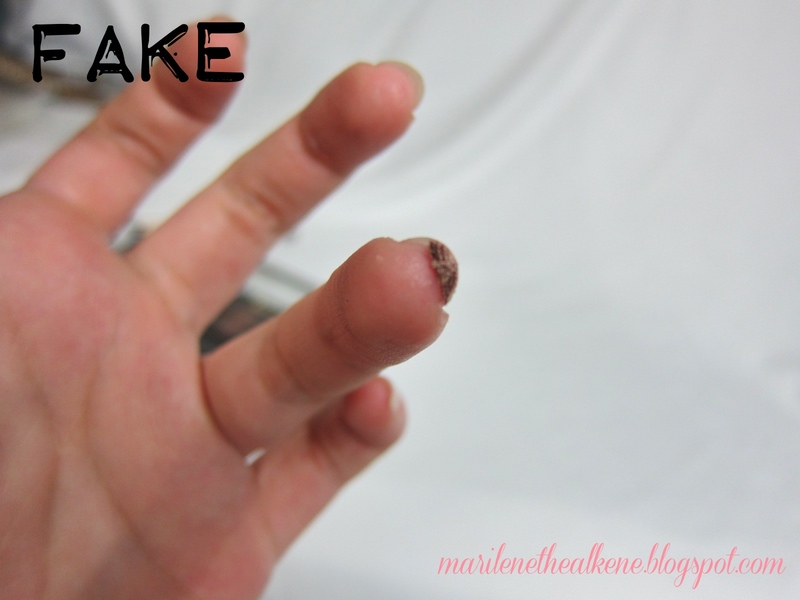 This removal led to a 0.15oz decrease in mass. Basing from this information, I am assuming that the eyeshadow powder itself is 0.05 oz and that the eyeshadow pot is 0.10 oz. 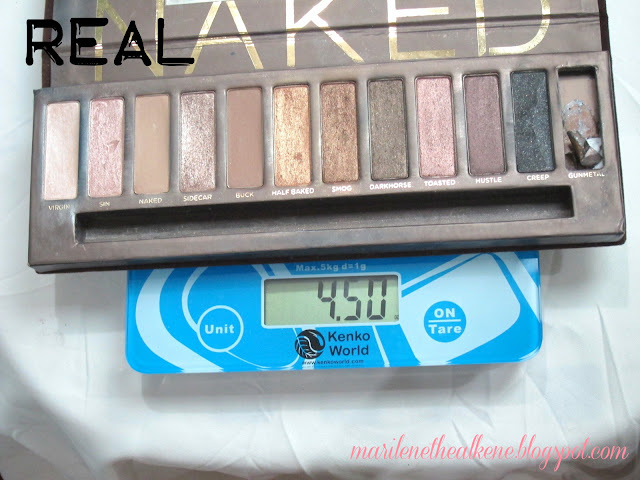 Now, the fake eyeshadow (this is also the one I used the least in the whole palette), which if real is also supposed to weigh 0.15 oz (because UD's website also declares that NAKED 2's eyeshadows are 0.05 oz), only weighed 0.10 oz. Had it not been for the extremely uneven fill of the pots, I would have assumed that UD just used a lighter material for their pots in this palette. But meh, it's so uneven that this eyeshadow pot that I took out did not meet the mass standards a UD NAKED eyeshadow is supposed to have. Real palettes would be stuck on super efficiently onto the palette that a lot of effort would be needed to depot it. It took me almost 5 minutes of tugging just to depot from the real one, and less than five seconds to depot from the fake one. 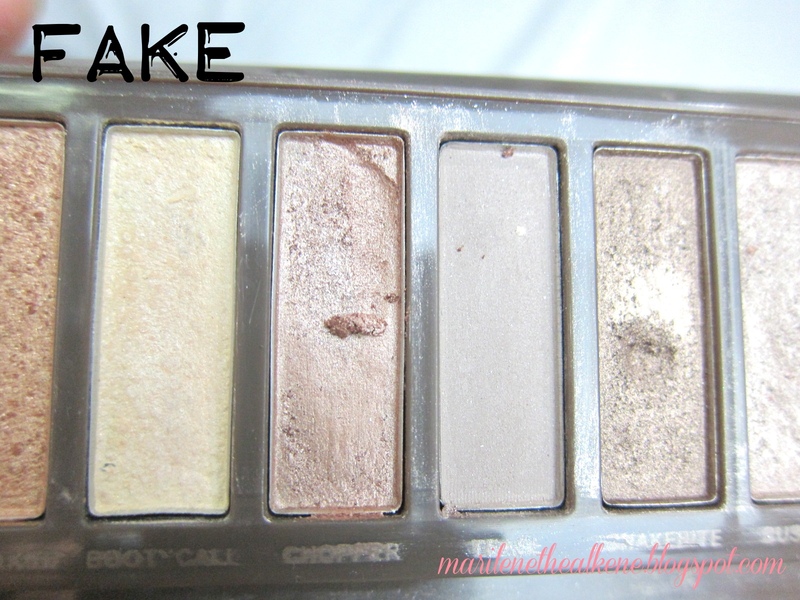 By the time I was able to depot the real one, the palette already got a bit warped. It really is glued soooo sturdily onto the base. If you suspect that what you bought is fake, you can try to depot one to see how well glued it is to the base. Just try shucking it with a knife gently and see what happens. 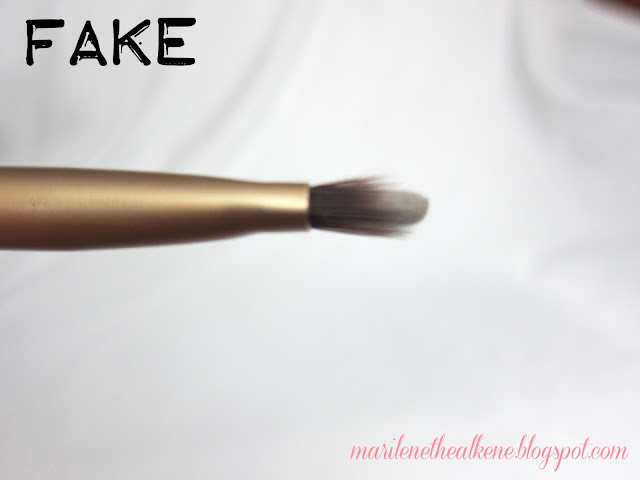 A fake eyeshadow pot is bound to come off even with just gentle effort. 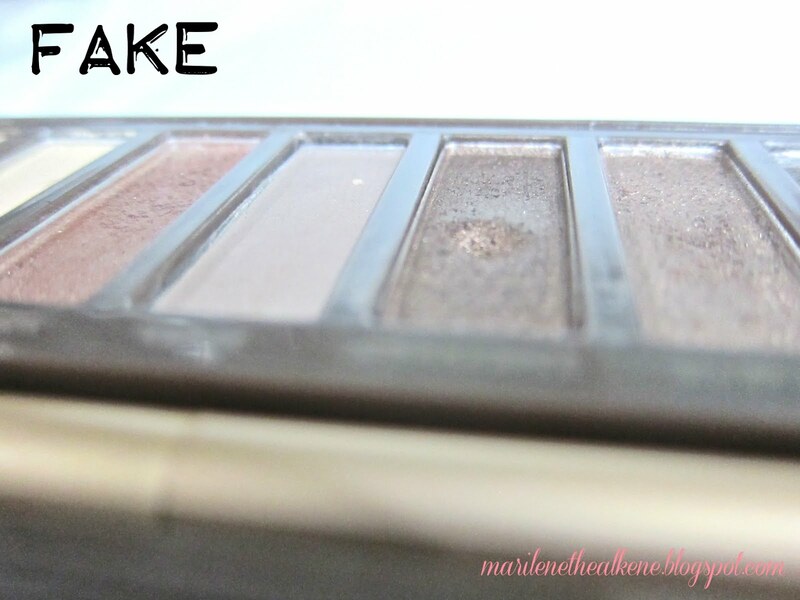 To prevent eyeshadow cracks and spills, just pour rubbing alcohol on the shadow before carrying this experiment out. For those who plan to buy them in the Philippines, by all means, not in Greenhills. NO NO NO because 99% of the palettes there are fake. 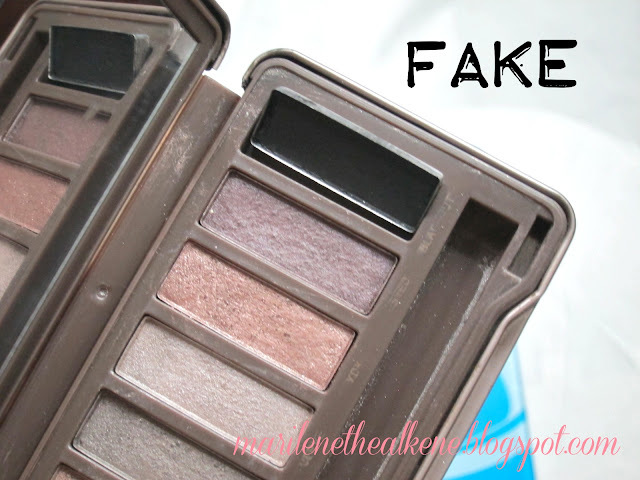 I cannot tell you how many sellers claim that their products are authentic even when they're not-- they do not even have the honesty or heart to say thay they sell 'Class A' or 'replica' goods! They even have the nerve to sell those for 1600 to 2500 pesos!!! This one came in the same fake box mine came with, and yet the seller even had the nerve to sell it for $65 even when the real ones cost just $52. 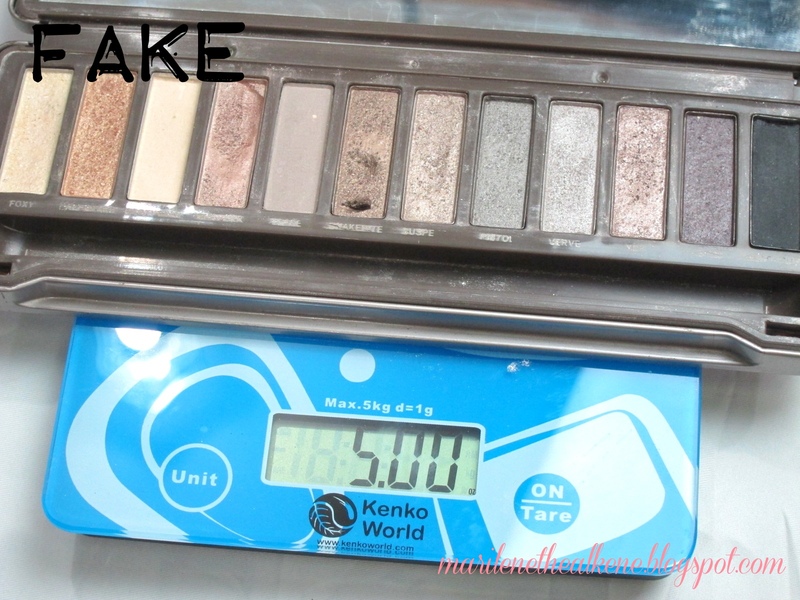 I don't think that there is any reason for them to sell the real ones below the SRP of 2200, and I don't think that they have the power to buy from the manufacturer of these palettes. Be very careful of the terms class A, replica, SG version, as these are all just fancy terms for fake. At the same time, do not be fooled by claims that they have a contact at the factory, or that there are overruns, or that somebody knows somebody who got them cheaply from the inside. All those are false claims made just so they can make a sale. 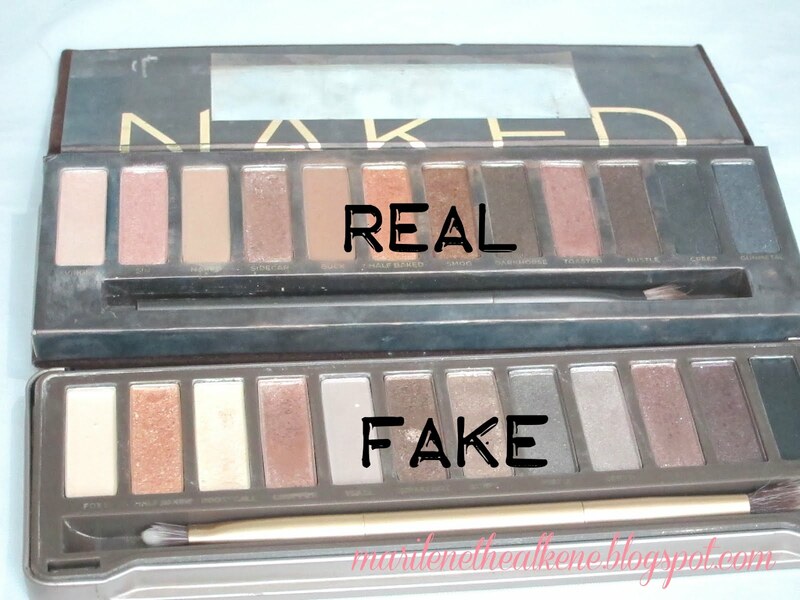 This is not an apples to apples comparison as this is a real naked 1 and a fake naked 2, but in general, there really just is a difference in overall feel. Urban Decay products should feel luxurious and should come in really high quality. If it feels tacky or funny, it must be fake.